The Grand Lodge of New York welcomes those qualified men who are interested in the possibility of joining our ranks — to become a member of a Fraternity whose members and principles have shaped our country and our history. Be a man age 18 or older. 2. Ask One of Us Today! If you know a Mason, ask him about the fraternity. Don’t be shy, we love talking to those interested in Masonry. If you don’t know a Mason, you can use the “Lodge Locator” to find a lodge near you and contact them. You can also ask a Mason on our website via “Contact Us”. Try to find out if there is a good time for you to visit the lodge. Take this as an opportunity to meet some of the members and ask questions. Don’t be intimidated, they’ll be happy to see you. Most lodges have dinner or social time before their regular stated meetings (meetings usually occur 2 times a month) and guests are almost always welcome. Visit as many as you can, get a feeling for the lodges you visit and pick the one that best meets your needs. Each lodge usually has a similar process to get to know the candidate and a typical process is listed below. First contact with the candidate. A couple meetings with some of the brothers. A social event such as a dinner, BBQ, educational meeting, etc. Family meeting – usually right in your home, so that your family can ask any questions that they may have. Fill out your lodges petition. There is an Initiation Fee (one-time fee for the three degrees of Masonry), as well as regular annual dues. These vary widely depending on the number of members, the actual physical facilities of the Lodge, etc. The fees and dues, however, are not prohibitively expensive. 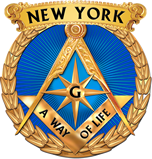 All applicants for membership in Freemasonry in New York are required to obtain a Background Check Report as a part of the application process. The Report will be sent directly to you. The cost of the Background Check is $15.00. After you’ve submitted your Petition, Initiation Fee, and Background Check your petition is read in a Lodge meeting by the committee (usually composed of three members). The committee and maybe some of the other members will report their findings to the Lodge, and a secret ballot is taken. Soon after the stated meeting, a member from the lodge should contact you with the outcome of the ballot and provide you with additional instructions.